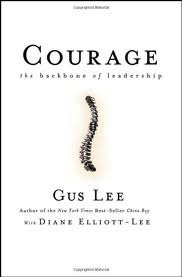 I attended a five day course last week on "High Core Values/Courageous Communication" that is based on Gus Lee's book, "Courage: The Backbone of Leadership." The course centers around the high core values which are integrity, courage and character. The course then shows you how to live those values. Part of living those values is being able to communicate effectively and being able to stand up for what is right. I've always tried to keep an open mind about the leadership courses offered at the academy but always been kind of leery because I feel like if you are trying to live your life the way God wants you too you should already be living those values that they teach you in these leadership courses. I think there is still something to be said for that. If we live our lives the way God wants us to then we will be the best person that we can be. But there is a different perspective they give that I appreciated in this course and that I took out of it. That was that I need to take the interior change that I'm always looking to make and by living those values I transfer them over to other people. In order to do that, I have to live up to those values and allow other people to challenge me when they see me not living up to those values. Another way I need to live those values is by standing up and correcting wrongs when I see them. When you do this, you aren't only living up to your values but you are also challenging them to live up to their own values. This is difficult to do. We are afraid of being judged. We are afraid of "imposing our values on others." But isn't that what courage and integrity are all about? Having the fortitude to stand up for what is right? Part of what goes along with this is the communication technique that you use. The book talks about talking collegiately, listening, empathy, asking questions. Basically, it talks about speaking with the person about the values that you want to convey with love while not being judgmental because you really are trying to understand their view point. In a capsule, the two main things I got from the course can be encompassed in two quotes. The first is by Mahatma Gandhi, "We must become the change we want to see in the world." and the second is from Proverbs 27:17, "As steel sharpens steel, so man sharpens his fellow man." It's now up for me to take these idea and take them to the world.